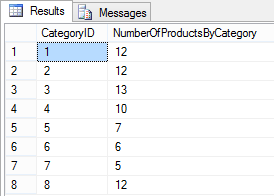 The above query joins the Categories table with the Products table to be able to select from both tables therefore giving the ability to select the CategoryName field. 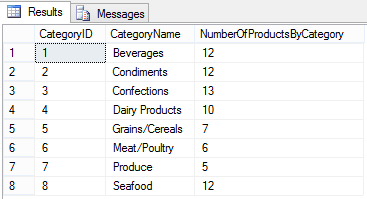 Column 'Categories.CategoryName' is invalid in the select list because it is not contained in either an aggregate function or the GROUP BY clause. And like magic the result came to your screen. Tears of joy were streaming down your face because you've gotten the results that you were looking for. 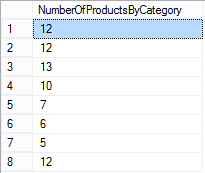 Option 2: You can select what you want from the Products table and then use the GROUP BY in another select in a RIGHT JOIN to the get the COUNT() for each category. You will get the correct results with this query as well.